SV54AUH Scania 94D-230/Emergency One CP31 (10 man cab) WrL. This 2004 appliances has a 10 man crew cab. Added by Bomba Boy on 13 November 2006. Can anyone tell me If any of the Scanias have a "six" seat configaration, with "B A" seats and if so what is the lay out ? Added by Martin Plowman on 18 March 2010. This machine has now been replaced with a new Scania reg No SV59 BVB as for crewing it is only for a six man crewing with extra space? Maybe another scottish colleque can enlighten? Added by Grant Melville on 19 March 2010. This machine is/was with Kilrush, County Clare, Ireland, accoding to another website. Added by John Foley on 16 June 2010.
the appliance mentioned above was a 53 plate that was based in elgin but was barely used, the one pictured above is now based at peterhead. Added by Martin Ross on 26 June 2010. Martin....what do you mean barely used? Does it mean it sat idle for most of the time and therefore who justifies the capital outlay for a rig like this when nobody uses it? Just curious. Added by Paul Streeter on 19 October 2010.
i believe they had some problems with it. therefore deemed it not fit for the job inhand. Added by Martin Ross on 19 October 2010. I think the pump we are talking about was the one off CARP which now lives in Ireland.Hope this helps. Added by Shaun R. on 20 October 2010. Surely the last three posts have got in a muddle. The Elgin appliance that was shipped to Ireland was a Scania CARP not a Scania pumping appliance. See picture #14024 for clarification. Added by Peter Williams on 20 October 2010. 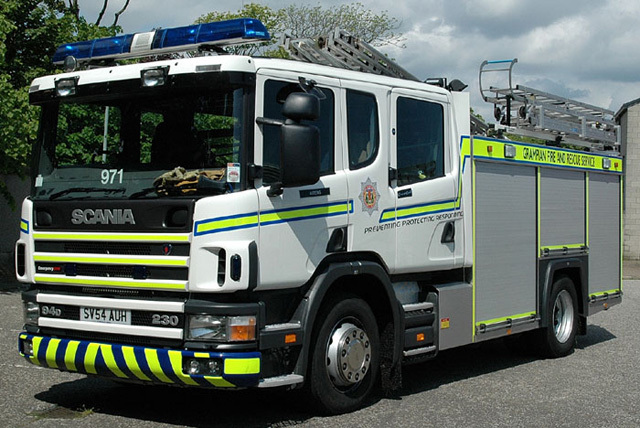 The appliance from Elgin SV52UOH is a Scania P94G-300/Angloco/Bronto F20CFT. She is now stationed in Kilrush in County Clare and re-registered to 03-CE-5359. Hope this helps. Added by Andrew Middleton on 20 October 2010. Added by Martin Ross on 21 October 2010. Martin Plowman: If you're still about, it's two in the front and four BA seats side-by-side in the back. Added by Alan S. on 12 September 2015.